This is the second map with detail illustrations of the different cities. In this one we see the three ringed walls of Qarth and it’s multi-coloured roofs, as well as a multitude of ruins – caused by the Red Waste, the Dothraki, or the blasted nightmare that is Valyria. The Valyrian peninsula was particularly fun to draw. The brief called for a blasted wasteland of ash with spurting lava and a smoking sea – that actually smokes. The city of Valyria lies in ruins, and the paths of the old Dragon Roads (the die-straight roads forged by dragon fire) now lie beneath the waves in many places. This hints at the magnitude of the upheaval that destroyed this land. 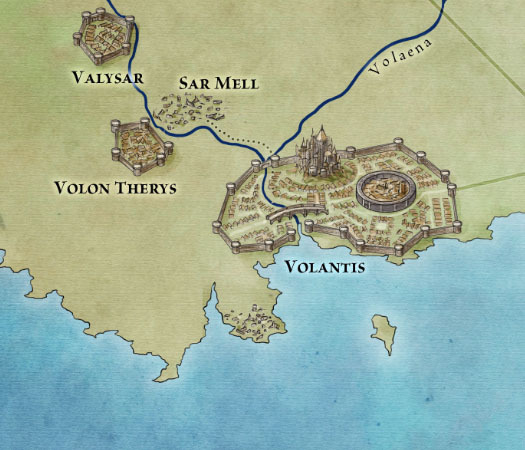 We also get to see a bit more of some of the cities that become important in the later books – particularly the city of Volantis at the mouth of the Rhoyne. Volantis has a couple of key locations – including the Black Wall, the Temple of the Lord of Light and the Long Bridge, which show up in the city thumbnail. But the key to this map is, of course, the Slavers and their cities. 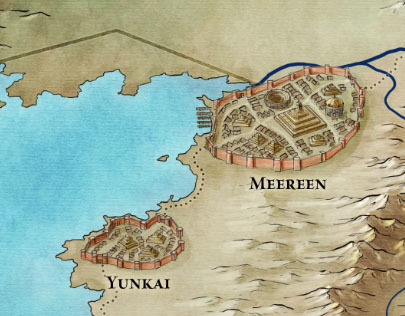 The cities of Meereen, Yunkai and Astapor get their own details, complete with the stepped pyramids and gladiatorial arenas. I have to say that having a map of the relative locations of the cities, the hills and mountains, and the river helped a lot when teasing out some of the events of the later books. 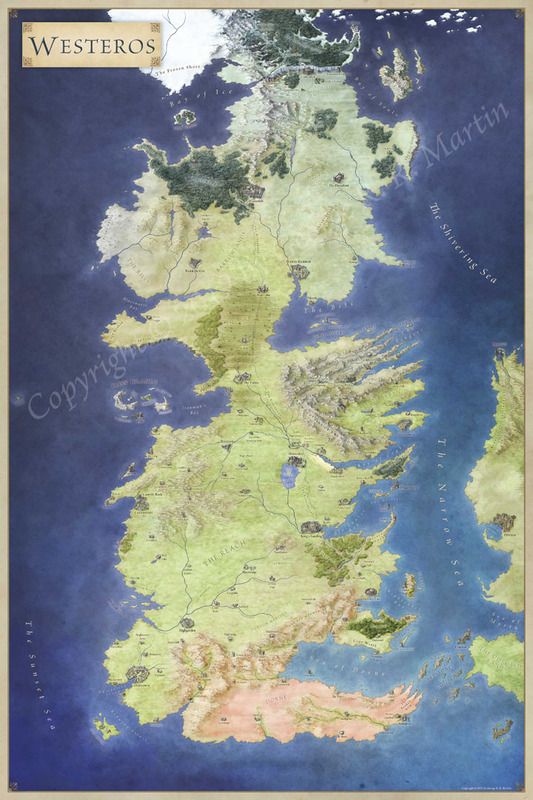 I was also intrigued to see the Dragon Roads reaching so far to the East, implying that the reach of the Valyrians was long indeed, and that Meereen has it’s own legacy with dragons. As with the previous maps, the high resolution version of this map can be picked up in poster form on Amazon, along with the other 11 map, for $2 a poster. Yup, we know from the books that the Old Ghiscari Empire controlled all of Slaver’s Bay and was finally destroyed by Valyria after five great wars. The Valyrians – presumably – then took over Slaver’s Bay itself. 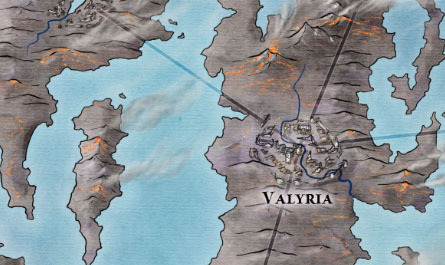 According to the (somewhat unreliable) dates in the books, Valyria must have ruled Slaver’s Bay for five thousand years. Even assuming it was only half that, it’s surprising how quickly the Ghiscari traditions reasserted themselves after Valyria’s fall, and how little trace is left in Slaver’s Bay of the Valyrian occupation. 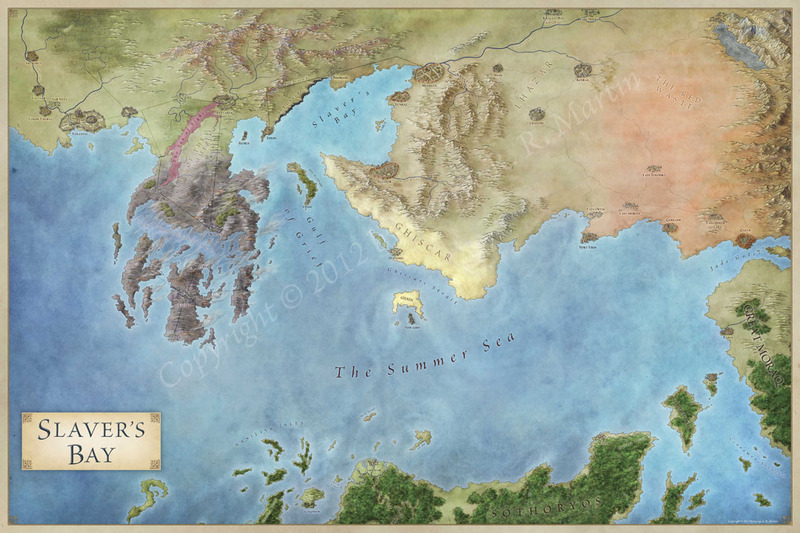 A bigger question, which GRRM to my knowledge has never addressed, is how far east Valyria’s influence extended. 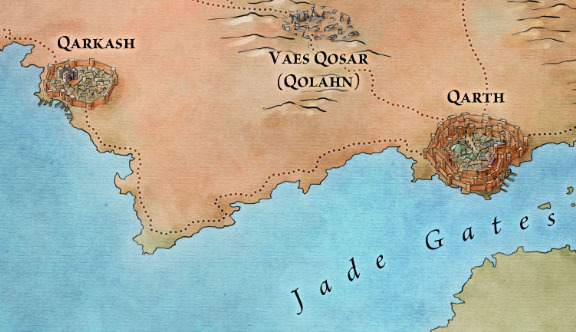 Some of the ruined cities in the Red Waste and Dothraki Sea have Ghiscari names, suggesting that Ghiscar’s influence extended that far, but we don’t know about, say, Qarth’s relationship with Valyria. Something, hopefully, that the world book will clear up.